Today we’ll be speaking with Veronica Morris-Moore from Fearless Leading by the Youth. In continuation of Bock History Month, the beer of the week is Anchor Bock from San Francisco Activist news of the week, a fracking update, and as always, the love! These are some photos from the march for a south side Chicago trauma center. A couple of weeks ago, several were arrested, and many roughed-up, as the police laid down the heavy hand on a group of 50 peaceful protesters that staged a sit-in at the new $700 million University of Chicago hospital. No judge recusal for Federal Judge Loretta Preska. The trial of alleged #Stratfor hacktivist Jeremy Hammond goes on in a kangaroo court. Doesn’t everyone go to the English garden to see naked people? The English garden, in the heart of busy Munich, the Bavaria capital in southern Germany, is an absolute destination, regardless of the time of year, and regardless whether there are actually naked people about. I was told, the first time I went there that I had to go to the English garden, dubbed “Naked Garden” by the travel agent, who had never been there. It was a perfect early autumn day, and warm, that first of what would become a half dozen trips to Munich, and nearly a dozen to Bavaria. Hotels are little more than a place to collapse at the end of the day when I travel. dumping my things on the bed in my quaint and comfortable room on Amalienstrasse, across from a little corner wine shop, I set off in reasonable haste to the English Garden. The English garden is a bit of a misnomer. It is more a park, a gathering place of broad green fields, a study in contrasts and visions unlike anywhere else in the world. This particular day the trees still had not begun to change, their full, rich, deep green bordering the vast openness, broken only by a small creek and a small banks of low, young trees. Crowning the park, upon a small rise, the stately Monopteros rotunda. Beyond the treetops teased the skyline of Munich, a mix of modern and old world architecture. The rush and racket of busy traffic along Ludwigstrasse was hardly a murmur here. That first breath of Aecht Schlenkerla Rauchbier from Bamberg, just north of Munich, quickly took me back to that Sunny afternoon. Schlenkerla smokebeer exudes a smoky pork essence lifting from the glass and the half inch cream-tinged head. This is the way hops were dried centuries ago, over an open flame, where they would inevitably pick up the smokiness of the fire, and perhaps anything coooking over the fire as well. This beer takes its name from that timeless process, dubbed smokehouse beer, as well as the Urbock tradition of a high alcohol content(6.6%ABV) and plenty of hops, which before refrigeration allowed shipping the beer across long distances. I was a very poor artist, that first trip to Munich, a week off my second trip to Bosnia and the besieged city of Sarajevo. I’d arrived by train, two days on the overnight from Budapest to Prague, and the all day stunning trip through the Bohemian forest to Munich. The famous Brauhoaus was a distant desire, but I taunted a growling belly by standing in the window and inhaling the smell of roasting pork loin turning and dripping over tickling orange flames in the window. The initial impression of this Urbock, or original Bock was reaffirmed interestingly in thetaste of smoky sweet pork nice little bitterness at the end. It was hardly overwhelming, and instead was more a character than a quality. Brian and I discovered a suprisingly complex and pleasant depth of taste to the richly colored deep umber brew. Aecht Schlenkerla Rauchbier was not at all heavy, and offered a slight tanginess that gave the overall experience a nice, balance overall. At the end, the lacing in these intricate and tattered rings in the tall mug was an art in its own right. Still I could hardly shake the memory of Munich, and how I would have loved to able to afford one of those juicy pork loins at the Brauhaus. Instead, with the sun setting, I slipped into a nearby market for some cheese, deli meat, bread and a couple of beers. Marienplatz was quickly empying of tourists, the shops shuttered and closing. The fading light played golden upon the gothic revival textures of the Rathaus. 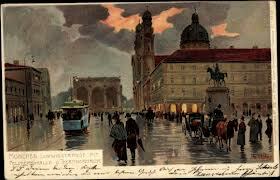 There was music playing in the dark halls and passageways beneath Feldernhalle, overlooking Odeonsplatz. The Theatinerkirche caught the last light of the day, deepening the shadows in the 19th Century Feldernhalle, or Field Marshall’s hall. A Roma girl played a lonely accordion to no one, her classical selections echoing away in the narrow passage. I settled on a bench, opened a beer and laid out the food. She smiled sweetly and played a tune to me alone. Too bashful to applaud when she finished, I motioned to the food. She took a piece of cheese, and with a quiet “Danke,” turned and was gone. I had not thought about that moment until tasting this beer. 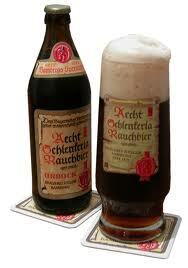 That is the magic of a good beer like Aecht Schlenkerla Rauchbier, described one of the 50 best beers in the world. It is definitely in my top 10. But a great beer can transport you back to those perfect moments, a place and a point in time. But if you’ve never been to Munich, Schlenkerla’s Urbock Rauchbier can take you there, just enough.incidentally, the wife and I never did the Brauhaus, preferring in stead markets and little out of the way discoveries for food and drink. You might not know this, but It takes about 26 gallons of water on average to make a 12oz. bottle of beer. This week the U.S. Army Corps of Engineers came out with a report that both Lake Michigan and Lake Huron are at there lowest levels since they started measuring it in 1918. This week on the show we’ll be with Bill Tressler from Green Bay’s Hinterland brewing the importance of understanding the ecology of beer. We’ll be sampling his Maple Bock. Return to the Facebook event page.